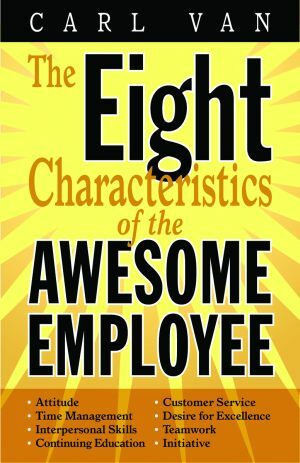 GRETNA, LA—Pelican Publishing Company is proud to announce the release of The Eight Characteristics of the Awesome Employee, written by Carl Van. Van will have readers looking for the awesomeness they have within themselves to renovate and rejuvenate performance in any job by incorporating his eight simple characteristics: attitude, time management, interpersonal skills, continuing education, customer service/empathy, desire for excellence, teamwork, and initiative. The difference between a good and an awesome employee isn’t the individual’s talent, intelligence, educational background, or job knowledge; it is attitude. His often humorous, real-world examples steer the reader along the path to becoming more productive, more satisfied, and more successful in any job. By using Can's straightforward road map to success, driven by easy-to-understand examples of performance issues, you can develop these eight keys to becoming the employee you were meant to be. Each section focuses on one general characteristics and provides on-the-job examples that will lead the way, including quotes from popular songs for the journey of your career. Carl Van is a poplular keynote speaker and opening presenter at claims conferences in the United States and Canada. He is the author of more than seventy-five technical and soft skills training workshops. He has dedicated his life to studying how people think and interact and has developed classes and programs to improve the success of individuals as well as business groups.